Disney’s live-action remake of Beauty and the Beast hits all the same beats as the beloved animated original. But in its opening, it does an even better job framing one of the story’s main themes: the contrast between the splendor of the Beast’s castle and the simplicity of Belle’s town. While the original told the Beast’s origin story through a stained glass vignette, the new film brings his princely youth to vivid life. The days of the prince (played by Dan Stevens) are one long sequence of sumptuous pleasures amid extravagant rococo finery. The highly literate Belle (Emma “Hermione” Watson once again typecast as a bookish beauty) is contrasted with the portrayal of the townspeople as rustically ignorant, conservatively hidebound, even superstitiously prejudiced. Belle’s sweet demeanor while singing the opening number makes it easy to miss the haughtiness of her derision of her neighbors as “little people” (the distracting autotune might be to blame as well). But then as the song’s tempo picks up, we find that Belle’s “quiet village” is actually anything but! In fact, it’s positively boisterous with the very vocal market activity characteristic of town life: the shoppers’ inquiries, the placing of orders, the “trucking, bartering, and exchanging” as well as the “higgling and haggling” (i.e., bargaining) written of by Adam Smith. And we see the division of labor (another Smith-ism) that is also characteristic of town life, and of civilization itself. These are not homogenous peasants eking out a bare subsistence by producing everything for themselves, but specialized workers and business owners all producing for each other in economic harmony: a baker, a shopkeeper, a fishmonger, a cheese merchant, etc. The town is so prosperous, thanks to the efficiencies of the division of labor, that it can even afford to support the highly specialized business of Belle’s favorite merchant, the bookseller. But it’s not all business in the bustling town. The townspeople are also cheerful and charmingly friendly, indicative of the commerce-bred civility that is also characteristic of town life. The world could use more such “little people”! Belle is friendly as well. But she also seems to consider herself too good for the work and commerce pursued by the “little people” around her. She longs to return to Paris, whence she and her father “came to this poor, provincial town” when she was a baby. While her father labors as an inventor to restore his family’s affluence, the working-age Belle leisurely meanders through town “with a dreamy far-off look and her nose stuck in a book,” reading fairy tales (the new film also has her reading more literary fare, like Shakespeare). Of course, given the oppressive customs of the time, as a woman, she didn’t have many other prospects. At one point in the film, Belle is berated by a schoolteacher for merely teaching a little girl to read. “Isn’t one enough?” he scolds. It is fitting that both Belle and her father are so inventive, because this period in the mid-18th century was a great age of tinkerers: most famously, James Watt, who put the finishing touches on a marketable steam engine. Unfortunately, women were not free enough to allow female tinkerers to make it rich in the burgeoning Industrial Revolution. Indeed, the townspeople who scolded Belle for promoting female literacy punished her by overturning her washing machine. Sadly, for Belle a prince charming was a much more likely path toward upward mobility than independent enterprise. Not to be a childhood-ruining killjoy, but who paid for all this? It’s not like the Beast is an entrepreneur: the local Steve Jobs, providing the townspeople with mass-produced magic mirrors that can make FaceTime calls. As the new film’s opening sequence makes explicit, the prince paid for his lavish lifestyle by levying taxes — so high that even lefty Hollywood regards them excessive — on the hard-working, commercial townspeople discussed above. The party-animal prince being transformed into a sulking beast may have amounted to a 100% tax cut for the town; no wonder the townspeople are so cheerful and thriving when we first meet them! All princes and other nobles, after all, are descended from beastly marauding warriors who settled down and transmuted plunder and tribute (protection money) into taxes and other feudal obligations. “The medieval city, born out of the economic development that took off between the tenth and the twelfth centuries was primarily an economic center, a center of production and exchange. Ancient cities like Rome, on the other hand, were primarily centers of consumption, not of production, and had no reason to claim any autonomy whatsoever: they had been founded by and for the state and as such they existed only for the scope of ruling, collecting taxes, running local administrations and lodging troops. Notwithstanding the distorted modern reputation of the Middle Ages, the Western tradition of individual liberty and the roots of modern prosperity began in the medieval town. The High Middle Ages in France were brought to a dismal close by King Philip IV. “Philip the Fair” centralized power by seizing control of the papacy, dramatically increased taxes, debased the French currency, expelled France’s Jewish population, massacred the international bankers known as the Knights Templar, destroyed the country’s independent trade fairs, and plunged France into a crisis with England that shortly after evolved into the disastrous Hundred Years War. The poverty engendered by this royal rampage contributed to the unsanitary urban conditions that were so hospitable to the Black Death that killed over a third of Europe. The towns that had been oases of prosperity had become death traps. French royal absolutism hit another peak with Louis XIV, whose wars, taxes, and mercantilist economic policies immiserated the French people, while in his Versailles Palace Louis practically invented the peacock court lifestyle so glitteringly portrayed in the opening scene of Beauty and the Beast. The “Sun King’s” successors continued his opulence, provoking a reaction among the people during the 18th century: the same century in which Beauty and the Beast is set and the original fairy tale was published. This was also the time of the French Enlightenment. Belle’s literacy and middle class background reflects real-world population dynamics of the time. And the middle classes were reading some pretty subversive stuff. The physiocrats, who were the first self-conscious school of economic thought, denounced burdensome royal exactions. Witty philosophes like Voltaire were skewering aristocrats and priests and championing the liberal and pro-commercial traditions of England in their wildly popular published works. Popular agitation resulted in liberalization and the lifting of burdens, including the mitigation of serfdom. The brilliant free market economist A.R.J. Turgot even became a top royal minister. But it was not enough to save the Bourbon dynasty. Louis XV famously warned, “After me, the deluge.” And indeed the French Revolution broke out during the reign of Louis XVI. The Beast’s castle being stormed by the townspeople evokes Parisian mobs storming, first the Bastille, and then Versailles. The shouts of “Kill the beast!” echo the bloodlust with which Louis and Mary Antoinette were executed and which caused countless aristocratic heads to roll in the Reign of Terror. Belle marrying an aristocrat on the eve of the French Revolution might not have been such a “happily ever after” guarantee after all. But it was not only the elite who suffered. The policies of the new Republic proved even more impoverishing and warlike than the ancien regime. There was hyperinflation, hyper-taxation, hyper-war-making, universal conscription, the genocidal War in the Vendee, and finally the Napoleonic Wars. What went so wrong? The great French liberal Benjamin Constant, who lived through the turmoil as a young man, argued that influential philosophes like Jean-Jacques Rousseau got “liberty” all mixed up. They had pursued the “liberty of the ancients,” which was the ideal of the republican city-states of ancient Greece and Rome: the “freedom” to participate in government, i.e. republicanism. What they really should have pursued was the “liberty of the moderns”: the individual freedom characteristic of the European commercial town. Republican “liberty” quickly devolved into mob violence, plunder-by-democracy, state-worship, and civil and international war. Like Gaston leading a bloodthirsty mob to the Beast’s castle, extremist republican demagogues like Maximilien Robespierre accumulated power by sacrificing scapegoats (see Rene Girard’s theory of the State as the institutionalization of ritual sacrifice), and were themselves sacrificed in turn. Thanks to the French liberals, France then gained a great deal of true freedom: in the individualist “town” sense, as opposed to the collectivist “republic” sense. The Industrial Revolution belatedly arrived and French living standards skyrocketed. One of the greatest triumphs of liberalism was the emancipation of women. “I want so much more than they’ve got planned,” Belle sang. Imagine the dreams she might have had, and been free to work toward, if she had been born after liberalism had demolished artificial barriers to female advancement in the private sector. Her “great wide somewhere” might have encompassed far more than the prospect of marrying into the tax-feeding power elite. 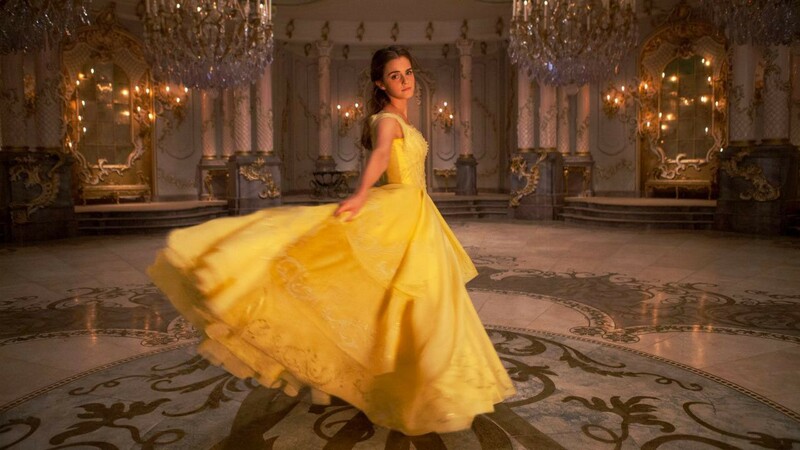 All-in-all, Belle is a strong and admirable female character. I’m glad I took my 4-year-old daughter to see the new Beauty and the Beast, and I’m glad she loves the original too. But I also can’t wait to introduce her to entrepreneurial role models, eminent “townspeople” like Atlanta’s Sarah Blakely, billionaire founder of Spanx: women who are free to create their own fairy-tale lives.